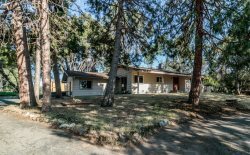 We also offer homes in the small town of Oakhurst, which is 14 miles south of the entrance to Yosemite National Park, in the foothills of the Sierra Nevada mountain range. Its elevation is 2,274 feet, and it has a population of 2,829. Here are the homes we offer in the Oakhurst area. For shops, restaurants and more in Oakhurst, please see the preceding page for those categories. Large Rustic Lakefront Home with Private Dock can sleep 20!